UDM Downloads > WAP Upload! Everyone wants to make their phone beautiful, original and unique. This can be accomplished in various ways: by replacing the front panel of the phone, buying a beautiful cover or uploading to the mobile phone your favorite music, interesting games or original screensavers. We do not sell games, pictures or melodies (you can find millions of files on the Net without effort), but we do offer you a service which helps you to upload the desired file to your phone. Music in a folder with music, games in a folder with games, etc. Our program is simply irreplaceable, for those whose phones have no IrDA, cable or Bluetooth interfaces. Many phones don't allow you to upload games, pictures or melodies via cable, but only through WAP. Therefore if you compose melodies, draw a picture or create JAVA games, our program will be your convenient assistant. And that's not all. You can surprise your friend or girlfriend. Upload a file (a picture, music or something else), and then send (via SMS or e-mail) a unique code of the file in our service to the person you want to surprise. The addressee opens (in the phone's WAP browser ) a link to our WAP site, enters a code and receives your surprise. 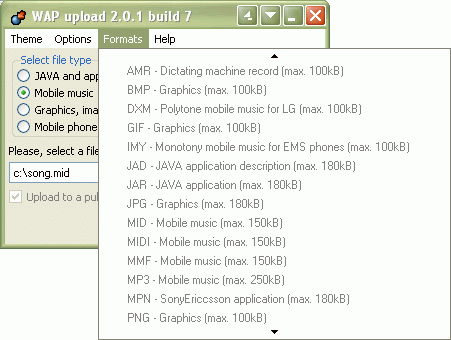 WAP Upload and our on-line service support more than 10 different file formats from the most widespread, such as GIF (graphics) and MID (melodies), to the less widespread, such as IMY (monophonic ringtones for mobile phones with EMS) or THM (themes for SonyEricsson mobile phones). Download a free trial version now!